English 429: The Eighteenth Century Novel: For Credit: Progression of Identities? For Credit: Progression of Identities? The young woman we are referring to as "Fantomina" takes on four separate identities in her quest to sustain Beauplaisir's interest: Fantomina, Celia, the Widow Bloomer, and Incognita. What significance (if any) do you detect in this selection and sequence of identities? Is it just a haphazard array, reflecting Fantomina's imagination, ingenuity, and acting ability (and Haywood's slapdash story-telling)--or is there some greater significance behind these particular identities and/or the order in which they appear (reflecting Haywood's deliberate literary artistry)? Please note that you don't have to answer this question exhaustively and conclusively with regard to all four personas! A simple "I do/don't think Haywood is crafting these four personas towards some significant literary end, and here's a reason why..." is enough. If you have more to say, that's great!--but a pithy three-sentence response that bears on just one of these identities will meet the expectations for this blog question. By all means, though, cite some specific text to support your claims (however limited or broad in scope they may be). Deadline: Tuesday (8/30), start of class. Please note that responses posted before midnight on Saturday (8/27) count towards your Week 1 blogging; responses posted after midnight on Saturday will count towards Week 2. I think "Fantomina" chose those specific roles versus just haphazardly choosing. What makes me think she specifically chose them was how different they were from each other. Fantomina was a young prostitute, Celia was a maid, Widow Bloomer was a widow and Incognita was, well I'm not really sure what she was exactly, besides the fact that she had a lot of money. In choosing such different personas, she could ensure that Beausplaisir could never suspect that it was the same woman, even though he was sleeping with her over and over. It would normally be impossible for the same woman to be both middle, upper and lower class, essentially making her disguise foolproof. I think that Haywood specifically selected the order in which each identity would appear in the novel for a specific reason. 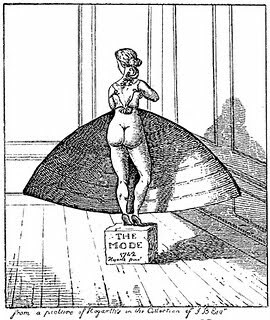 The last identity, "Incognita," represents how the "young Lady of distinguished Birth, Beauty, Wit, and Spirit" was completely wiped away by her pursuit of Beausplaisir. By the time that Fantomina creates the disguise of Incognita, she has only one focus in life, which is to seduce Beausplaisir; she literally becomes faceless, only willing to show her face if Beausplaisir will love her again. I think that Haywood's purpose in doing this was to impress upon her readers the dangers of one sightedness. I agree with what Krista is saying about how the last identity "Incognita" represents Fantomina's identity being discombobulated. It almost seems like Fantomina ran out of ideas of what and who to be. Keeping up with so many identities takes so much work and when people start to lose themselves bit by bit, in the end, they won't know themselves either. Identity is complicated. In the end, we can only be one person. I agree with Krista and Christina, in that the sequence in which "Fantomina" chose her characters was done purposely. Haywood progressively made the character get deeper with each personality/name change. Incognita is the most intense character, which is why Haywood was saved for last. This character's sole purpose was to make Bleausplaisir her's and wanted to show readers how obsessiveness and one mindedness can make one crazy. female created was to show the reader how naive Fantomina was, and how she never truly had a chance with Beauplaisir. He is equally attracted to all of these different women with completely different looks and personalities. He has no "type" when pursuing these women, which shows the reader that he sees these relationships in a more shallow light. To him, these are just conquests, but Fantomina cannot see that. I agree with everyone when they say that Haywood purposely ordered the characters. I find the name selection of each facade incredibly interesting as well. Fantomina, if I am correct, is referring to a phantom, and obviously, Incognita is referring to one who is in disguise. The name "Fantomina" and the idea of a "phantom" strikes me as important because of the manner in which a phantom is elusive and able to move about quickly without detection. Placing "Fantomina" as the first character sets a precedent for each following disguise that the character will be short-lived, ephemeral and always right outside of Beauplaisir's grasp. I am also on the same page as everyone else. From my interpretations I would have to agree that Haywood purposely ordered the characters in a specific order. By starting off with the character of Fantomina and ending with Incognita I think that there was a good emotional balance that readers were taken through. Starting with the prostitute and ending with a rich character it shows the versatility of our character and her abilities to perform as a stronger women in society when compared to men during that time period. I agree with Megan in the sense that the character of Fantomina also sets a good disguise for the following characters. Haywood is definitely creating a more intriguing way of telling this type of story that is very much entertaining for the reader. However, I do believe that the order in which the women come about in the story is significant. Each woman seems to be stage that this one individual went through in order to woo Beauplaisir. Starting with Fantomina being sort of who she really is in a way and kind of setting up the story for us. To Incognita being the really sneaky, shady, and pretty much "slutty" individual that she is. Excuse my language. Thus far, Fantomina and Incognita have really been the only two identities discussed with any detail. I agree with the previous posts as to why Haywood may have chosen those two specific identities. Fantomina being a prostitute is, of course, a very sexual object and Incognita's masked and mysterious nature also possesses obvious sexual undertones not including her overt actions. However, Celia and the widow both seem much less so sexual by profession and identity. Also, their names do not seem suggestive of any particular significance, which is unlike what has been pointed out about Fantomina and Incognita. I agree with my fellow classmates that Haywood distinctly chose the order and personas of Fantomina. She begins by taking on the role of a prostitute, an individual who is already seen as fallen and disgraced. A prostitute is expected to be without virtue. Although readers know that Fantomina actually comes from an affluent family, it is expected that Beauplaisir should enjoy the company of a prostitute without much inhibition since she is a fallen woman by trade. Later, as a maid, Beauplaisir enjoys her sexually. From the lower class, it is easier for individuals to accept that a young beautiful woman in the service of a young gentleman should possibly indulge him sexually, although it would probably be less condonable than a prostitute. After becoming a maid, Fantomina became the Widow Bloomer. The widow status is of a woman who has already been married, who has already been a presumably chaste wife but who, due to seduction, is no longer the virtuous woman awaiting remarriage or mourning after the death of her late husband. It would probably have been rather troubling for society to believe that an esteemed and once honorable widow should indulge in such desires more so than the young maid and prostitute. Finally, Beauplaisir conquers Incognita. She is beautiful and affluent, but also susceptible to carnal desires. This persona might have been the most troubling of the four since she represents the upper class where women are by necessity made chaste. Her role is to marry an affluent man with land and money and to produce an heir (male). She represents a threat to this land-based patriarchal society. As one can see, Haywood uses all four personas in such a way that increases shock value as the short story comes to a climax. For Credit: Is This Thing On?